Before you take the key, know what your damage liability is. 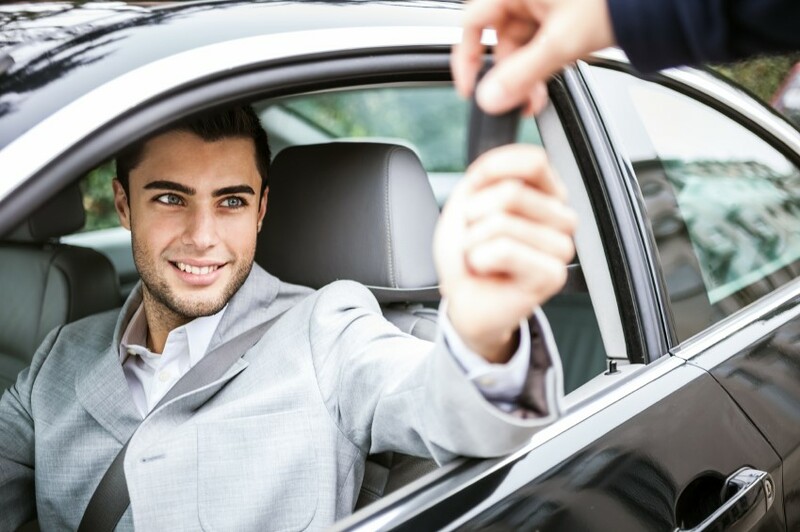 When booking a car rental, the price you believe you are paying and the price you actually pay by the time you complete the rental process might be quite different. You may book online and think that you are getting a great deal for a car for $175 for a full week only to walk out of the rental office paying more than double that. What happened? When you consider the addition of all of those extraneous and outside fees, the price of renting really can start to pile up quite quickly and it’s a sinking feeling. Let’s look at some of the things that can push the price, so you will have a better idea of what you need to be watching for with quotes and so you can avoid that sinking feeling. You always need to consider taxes when you are renting a vehicle. It doesn’t matter where you are, there will always be taxes associated with the final cost so make sure you know the taxes in your area and estimate those if the quote does not already do that for you. Keep in mind that in addition to the state taxes, there can also be local taxes. Picking up a rental car in many Australian airports actually costs between 16% and 20% more than picking them up at a downtown location would cost. If you plan to rent for a longer period, it simply makes more sense to pick up from a downtown location instead, as it will save quite a bit of money. Many times, a rental agency will charge your credit card a deposit when you rent. The amount will vary based on the company from which you rent. They will return the amount of the deposit after you return the vehicle, so long as there is no damage to the vehicle and you have not misused it in any way. An example of misuse might be smoking in the vehicle, for example. The deposit fees in Australia and New Zealand are generally between $100 and $500. You need to have at least that much available on your credit card. Of course, you also need to think about insurance. If you have your own car or travel insurance, then there is a chance that you will not have to pay auto insurance through the rental company. However, this is something you need to consider quite carefully. It might be a good idea to choose a collision damage waiver or loss damage waiver so if anything happens to the vehicle you are not responsible for the repairs. In Australia, the rental car excess fee can be as high as AU$4-6,000. It can be very difficult to understand exactly what your insurance will and will not cover. By choosing the insurance through the rental company, it can also remove some of the burden from your own insurance policy. It’s a badly kept secret that car rental firms tend to charge excessive prices to insure the excess, and this is often as much, if not more than, the rental car cost itself. 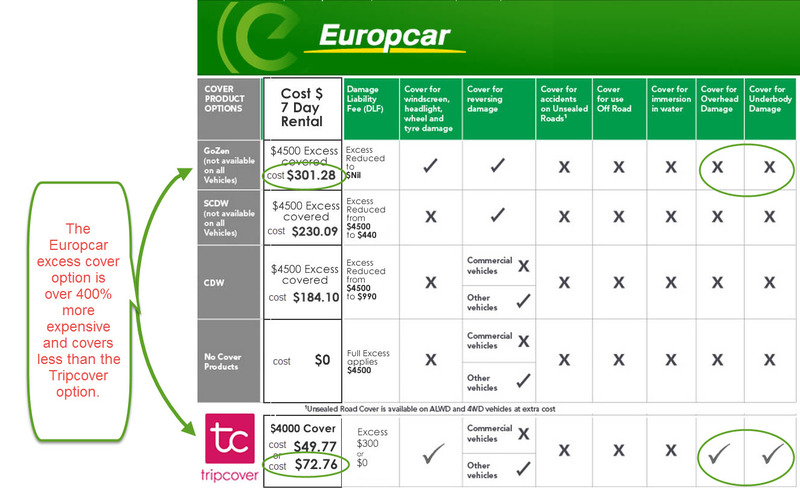 Keep that in mind and consider some of the online alternatives to insure your car rental excess (see comparison between Europcar and Tripcover below*). As always, it is very important to read the fine print on the insurance from the renal firm or other providers– yours and that offered by the car rental company – before you make your final decision. * As mentioned above it can be very complicated to understand the rental car company actually covers. This table has four options from Europcar, with the bottom option being not to cover the excess of $4500. The 2nd option (CDW) reduces the excess liability from $4500 to $990. And if we look at the premium option, called GoZen, this reduces the excess liability to $0 although will set you back $301 for a 7 day rental. Compared to the Tripcover.com.au product, GoZen costs 4 x more and covers less items, given overhead and undercarriage options are not covered. Whereas with Tripcover damage liability to these areas of the rental car are covered up to $4000. Another cost that you the quote really won’t cover is the cost of petrol. Not only will you have to calculate the cost of petrol on your trip, you also have to calculate how much the rental company requires you to place in the vehicle before you return it. Most often, you need to return a full tank, given the Australian rental companies tend to fill the car up before the rental starts. Find a petrol station and fill up before you drop off the car, otherwise the company will charge 2-3 times higher price per litre, if they have to fill up for you. If you return the vehicle to a different location or city for any reason, there will generally be an added drop off charge. Those who plan to drop off at another location should check their online car rental quote to see if a one-way fee is charged and how much it is. It should be displayed in the actual online quote. If you book on the phone or through a broker make sure to talk with the rental company and let them know it’s a one way rental, and also ask about these fees to get the full picture of how much you will have to pay.